Kitchen organization seems to fall short where junk drawers are concerned. It’s often a bottomless drawer of random things from all over the house that have ended up in the kitchen! 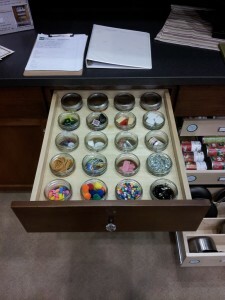 While it might be tempting to simply ignore this space, it’s a great place to add some customization to keep organized. We’ve developed the “un-junk” drawer. 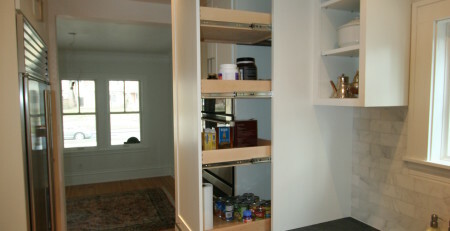 We find that having a specific place for the items you really want to store in the kitchen keeps the drawer from becoming a catch all for items that don’t really belong there. To decide what should go in the “un-junk” drawer, follow these steps. Start by emptying the drawer. Toss or relocate items that don’t need to be in the kitchen. This prime real estate should be reserved for items that you use frequently. Sort everything into like items. Assign them a place in the drawer. You’ll be able to quickly see what you need and know when you need to replenish that supply of paper clips or batteries! Following these steps and adding this to one of your existing drawers will banish that junk drawer for good! 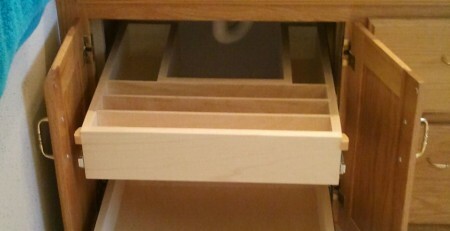 Help Your Shelves can build these to fit any drawer or even make a new roll out with the insert in it.